Heading north to an area of London that remains relatively unknown to the hoards of tourists that frequent our cosmopolitan capital lies a British bespoke tailoring brand. Nestling on Chiltern Street, this gentleman’s clothing retailer exudes British spirit, ingenuity and creativity. A wholly British tailor, who only uses British cloth to complete his suits. This little known brand has big aspirations and is the perfect match to our previous luxury footwear retailer, Joseph Cheaney. 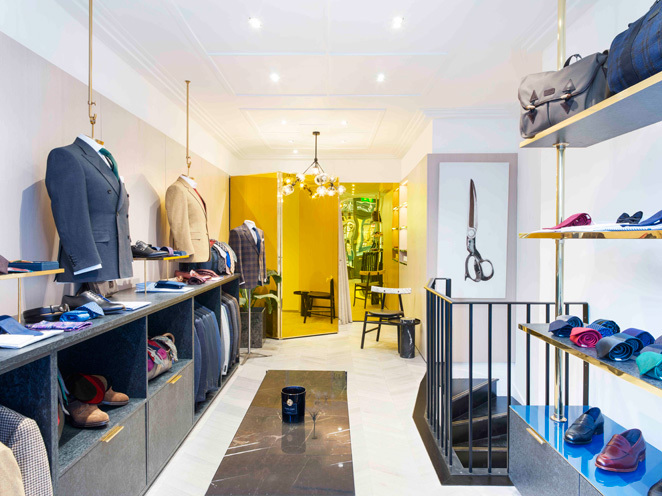 Campaign Design, together with founder, Saville Row tailor Thomas Mahon, have created a fitting emporium for this exceptional retailer. Although young in business terms – English Cut was launched in 2001 – the brand carries a century’s weight of great British tailoring tradition and prides itself on delivering a bespoke collection. 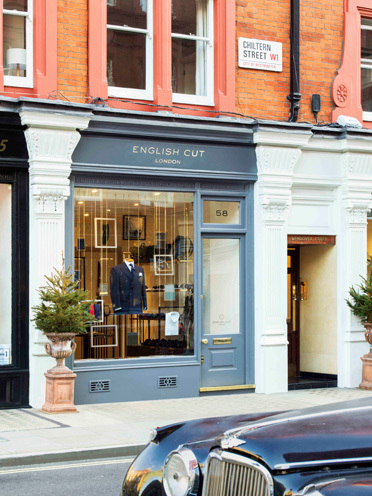 English Cut has chosen to retain its historic shop front and has added a touch of gilt in the details, including the signage, to convey an air of exclusivity. A single bust displays one of the jackets in the window, which is surrounded on all sides by abstract frames - a single item of clothing is suspended within each frame. It forms a nice visual merchandising touch that highlights the brand’s attention to detail. Inside, the serious lack of shop floor dictates the design and it is very simple. On the left perimeter wall jackets and splendid shirts are hung within low, veneer-clad units. Much like a wardrobe, it adds to the personal touch. Accessories such as shirts, ties, shoes and belts are then folded and showcased on the top of these cabinets. Two further busts are hung from the ceiling on gold poles displaying key formal jackets with additional minimalist style shelving in-between, drawing your attention to co-ordinating attire. On the opposite side of the store a range of footwear is displayed on low level cabinets. 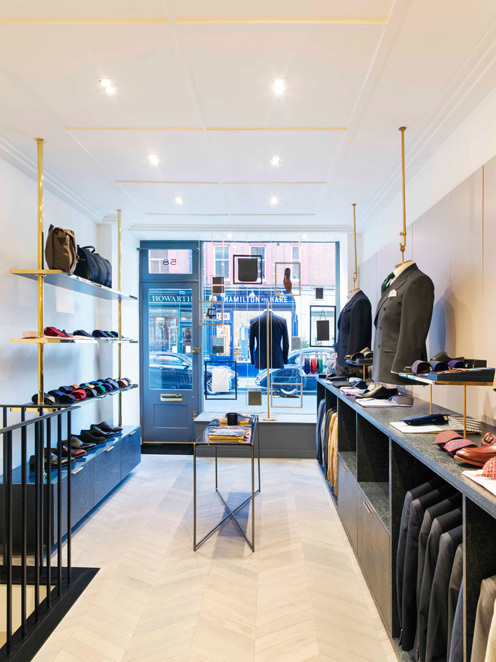 The unit reaches to the ceiling with two gold poles and just has three equally spaced shelves above it; one to display an array of colourful ties, one to display a selection of shirts and the last to showcase leather holdalls and bags. A very narrow, freestanding display table is positioned in the centre leaving just enough room to shop the store. At the rear a sunshine yellow, mirrored, acrylic screen grabs your attention and separates the cosy changing area. It creates a bold modern statement in this subdued, classy interior. The ceiling is white and retains the elaborate turn of the century cornicing and panelling. A very distinctive pendant light feature brings another contemporary twist to this traditional ensemble. The walls, which are clad with textured panelling, bring a subtle reference to the materials used in tailoring. The chevron flooring, whilst neutral in tone, also adds further layers of mercantile context. Downstairs has an even more intimate feel; a blue, velvet curtain is used to mask off the changing area at the back of the store and a large cutting table showcases the various fabrics that are available. A tape measure is casually slung over a wall mounted garment rail that is also used to display sample jackets. Everything in this retail outlet is measured and refined, balanced and co-ordinated. It is a perfect mix of modernity and tradition, which precisely mirrors the brand’s ethos. It is a very fine example of the power of the quality independent.